The assigned identifiers must be manually set on every given entity prior to being persisted. For this reason, assigned identifiers are suitable for natural keys. For synthetic Primary Keys, we need to use a generated entity identifier, which is supported by JPA through the use of the @GeneratedValue annotation. The AUTO identifier generator strategy chooses one of the other three strategies (IDENTITY, SEQUENCE or TABLE) based on the underlying relational database capabilities. While IDENTITY maps to an auto-incremented column (e.g. IDENTITY in SQL Server or AUTO_INCREMENT in MySQL) and SEQUENCE is used for delegating the identifier generation to a database sequence, the TABLE generator has no direct implementation in relational databases. This post is going to analyze why the TABLE generator is a poor choice for every enterprise application that cares for performance and scalability. The lock statement is executed to ensure that the same sequence value is not allocated for two concurrent transactions. The current value is incremented in the data access layer. The new value is saved back to the database and the secondary transaction is committed so to release the row-level lock. 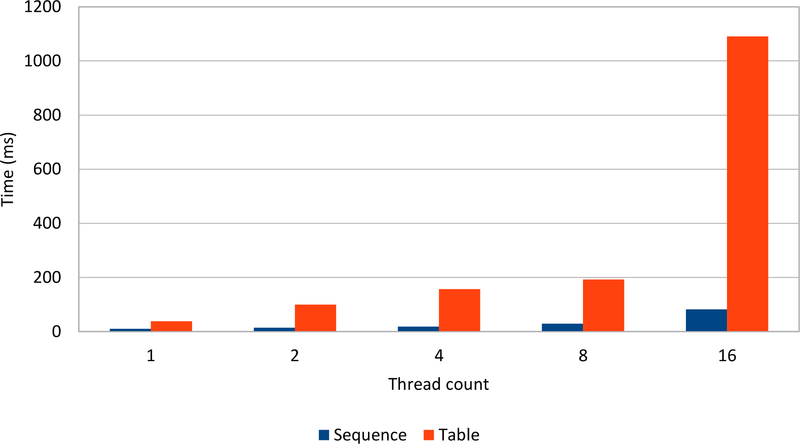 Unlike identity columns and sequences, which can increment the sequence in a single request, the TABLE generator entails a significant performance overhead. For this reason, Hibernate comes with a series of optimizers which can improve performance for both SEQUENCE and TABLE generators, like the pooled or pooled-lo optimizers. Although it is a portable identifier generation strategy, the TABLE generator introduces a serializable execution (the row-level lock), which can hinder scalability. Because of the mismatch between the identifier generator and the transactional write-behind cache, JPA offers an alternative sequence-like generator that works even when sequences are not natively supported. A database table is used to hold the latest sequence value, and row-level locking is employed to prevent two concurrent connections from acquiring the same identifier value. A database sequence is a non-transactional object because the sequence value allocation happens outside of the transactional context associated with the database connection requesting a new identifier. Database sequences use dedicated locks to prevent concurrent transactions from acquiring the same value, but locks are released as soon as the counter is incremented. This design ensures minimal contention even when the sequence is used concomitantly by multiple concurrent transactions. Using a database table as a sequence is challenging, as, to prevent two transactions from getting the same sequence value, row-level locking must be used. However, unlike the sequence object locks, the row-level lock is transactional, and, once acquired, it can only be released when the current transaction ends (either committing or rolling back). This would be a terrible scalability issue because a long-running transaction would prevent any other transaction from acquiring a new sequence value. To cope with this limitation, a separate database transaction is used for fetching a new sequence value. This way, the row-level lock associated with incrementing the sequence counter value can be released as soon as the sequence update transaction ends. For local transactions (e.g. RESOURCE_LOCAL in JPA terminology), a new transaction means fetching another database connection and committing it after executing the sequence processing logic. This can put additional pressure on the underlying connection pool, especially if there is already a significant contention for database connections. In a JTA environment, the currently running transaction must be suspended, and the sequence value is fetched in a separate transaction. The JTA transaction manager has to do additional work to accommodate the transaction context switch, and that can also have an impact on the overall application performance. Without any application-level optimization, the row-level locking approach can become a performance bottleneck if the sequence logic is called way too often. To evaluate the concurrency cost of each identifier generators, the following test measures the time it takes to insert 100 Post entities when multiple running threads are involved. JDBC batching is enabled, and the connection pool is adjusted to accommodate the maximum number of database connection required (e.g. 32). In reality, the application might not be configured with so many database connections, and the TABLE generator connection acquisition cost might be even higher. The first relational database system under test supports identity columns, so it is worth measuring how the identifier and the TABLE generator compete because the Hibernate IDENTITY generator does not support JDBC batching for INSERT statements, as explained in this article. Each test iteration increases contention by allocating more worker threads that need to execute the same database insert load. 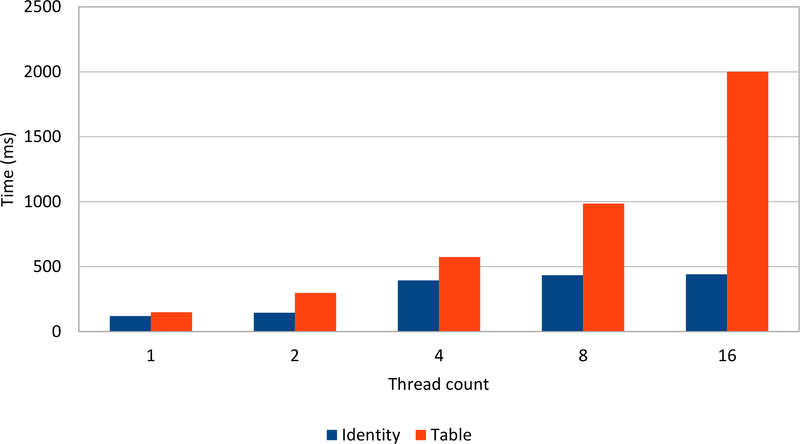 Even if it cannot benefit from JDBC batching, the IDENTITY generator still manages to outperform the TABLE generator, which uses a pooled optimizer with an increment size of 100. The more threads are used, the less efficient the table generator becomes. On the other hand, identity columns scale much better with more concurrent transactions. Even if does not support JDBC batching, native identity columns are still a valid choice, and, in future, Hibernate might even support batch inserts for those as well. The gap between the sequence and the table generator is even higher because, just like the table generator, the sequence generator can also take advantage of the pooled optimizer as well as JDBC batch inserts. The performance impact of the TABLE generator becomes noticeable in highly concurrent environments, where the row-level locking and the database connection switch introduces a serial execution. The row-level locking solution employed by the TABLE generator incurs a serialization portion which hinders concurrency, as explained by the Universal Scalability Law (which is a generalization of Amdhal’s Law). Because they use lightweight synchronization mechanisms, database sequences scale better than row-level locking concurrency control mechanisms. Database sequences are the most efficient Hibernate identifier choice, allowing sequence call optimizers and without compromising JDBC batching. If you want database portability, you don’t really need the TABLE generator. You can mix the SEQUENCE and the IDENTITY generator as explained in this article. Do you have a recommendation for TABLE_PER_CLASS inheritance on MySQL, where auto_increment and sequence are not an option? Is the TABLE strategy the only possibility for that case? Sure, I have. Check out my High-Performance Java Persistence book for more details. I have to agree with Axel. I’m using JPA TableGenerator with an allocation size of 1000. Looking at the debug-level messages, the ID table is accessed only once until I insert 1000 rows. At the same time, I seem to remember that Oracle allows this sort of behavior with sequences. BTW, I’m using MySQL, which doesn’t have sequence support. You are talking about single-threaded use cases. Try it with 8 or 16 threads, all trying to insert data into the same table. I think, your post is only true, if you set the allocation-size to 1. But, what, wenn you set the allocation-size to 500? The EntityManager will update the sequence table only once. Then, the em caches the id’s. So, if you insert 1000 entities, we have only 2 select for updates again the sequence table. What about sequences? Oracles sequences have only sequence.nextval(). What, if we insert 1000 entities? The ORM will fire 1000 SQLs (select sequneces.nextval from dual). This ist not verry clever and will be slow. So, i think, your post is only the half true. If you have a application whit many inserts, the use of Generatortype.Table ist the once with good performance. Most unit if works insert a small number of entities since that’s the norm in OLTP applications, meaning you will still call the Table generator a lot. You can find a benchmark in my High-Performance Java Persistence book which proves that Sequence is always to be preferred.